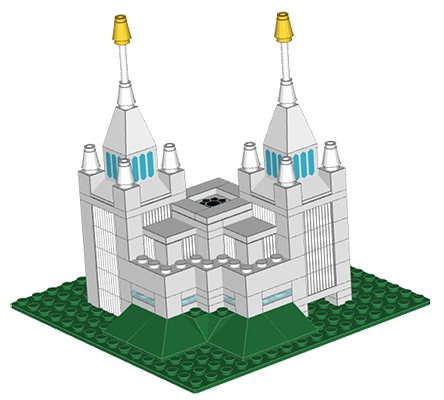 We design and sell LDS LEGO® Temple instruction manuals. 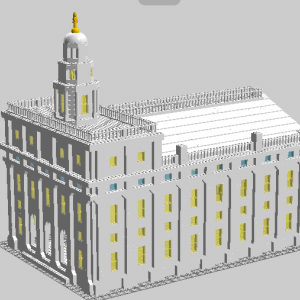 Our sets range from the more practical Small Sets with about 200 - 300 pieces to the more impressive Collector's Edition which have over 2,000 pieces. 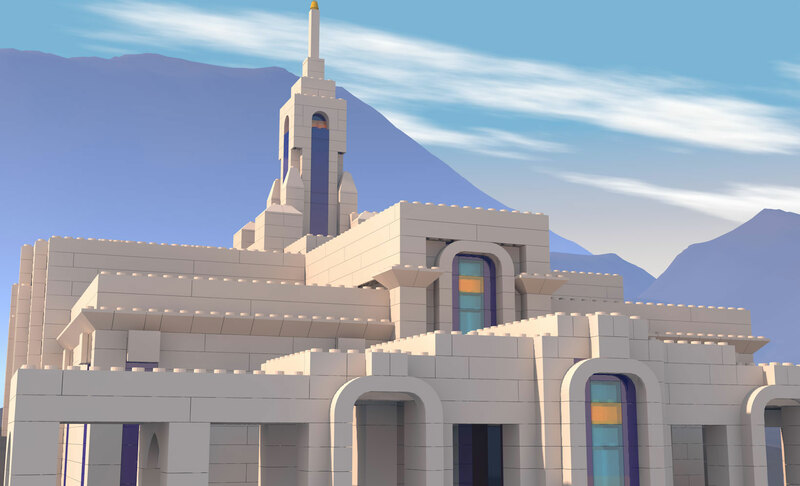 Parents and kids alike love to gather and build LEGO® temples together. By buying the instruction manuals only people can save money by not having to buy pieces they already own. 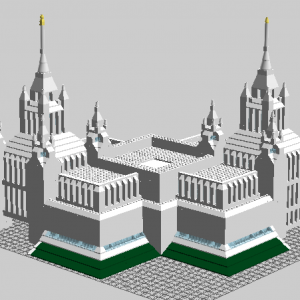 Also, a lot of the temple designs use many of the same pieces and that can save money as well. 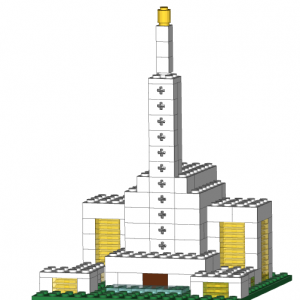 In all of our current temple designs we are using a yellow Microfig (LEGO® ID 85863). This piece can be hard to find. 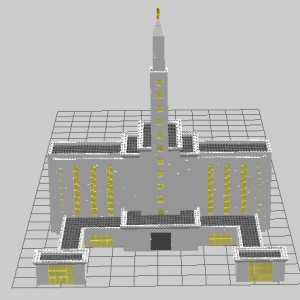 I was recently contacted by Steve Jensen who shared with me his wife’s design for an Angel Moroni. I found it clever and got his permission to post it here. It consists of a yellow cone underneath a yellow round plate underneath a yellow lever. He informed me that you can’t buy an all yellow lever so you will need to buy a yellow lever and a yellow base separately. 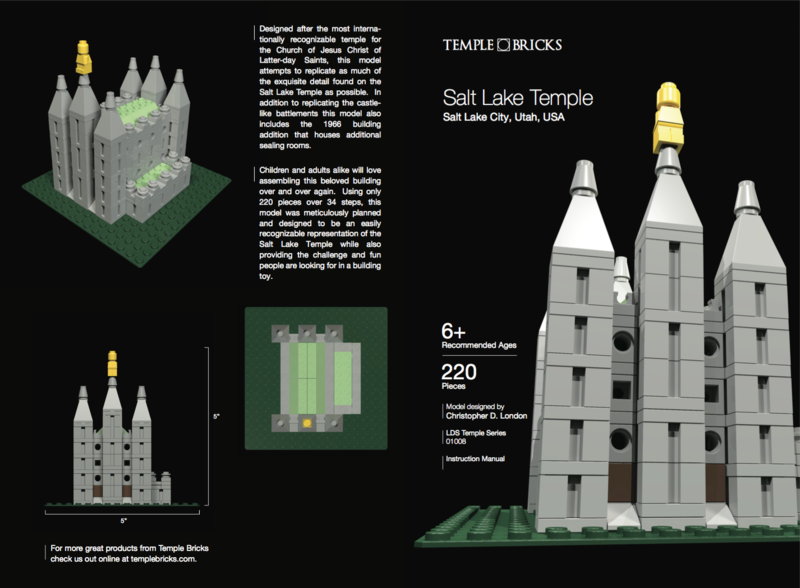 Our first instruction manual is now available for sale. 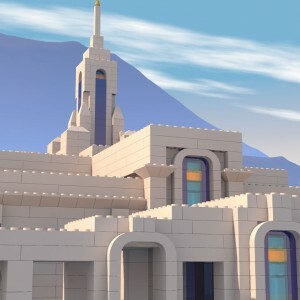 The San Diego California Temple from the LDS Temple Series is currently on CreateSpace and soon to be on Amazon.com! 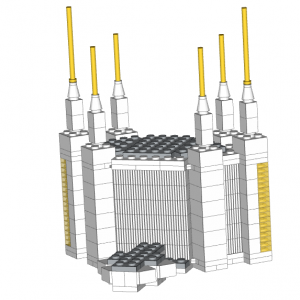 Do you have an instruction manual but you need to buy pieces? This guide will help you. There are several places where you can buy bricks and they each have their own advantages and disadvantages. 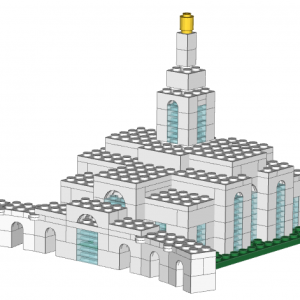 In all Temple Bricks instruction manuals there is a “bill of materials” which lists all of the parts needed for the set. Each part has a picture, the amount needed notated like “x24” meaning there are 24 of that particular piece and an ID number like 3002 which is used for finding the piece to buy. Brick link is a website where anybody can list pieces they have for sale. It’s a lot like Ebay where you have different sellers with different ratings. Pieces are listed from all over the world so there is a vast supply of all pieces, shapes, sizes, and colors. Pros: Cheapest place to find bricks! Huge variety of different shapes, sizes, and colors. Cons: Parts are listed from many different sellers. Shipping parts from different sellers eats away at the cost savings. Site isn’t user-friendly. How to buy: There are a couple ways you can get pieces on Brick Link. The easiest is to just do a search by the ID number and find whomever has the cheapest but because you may pay a lot in shipping from many places another option is to create a wish list and add all the parts to it. From the wish list you can view who has the most pieces you’re looking for. Another option that we haven’t tried yet is Brick Wizard. It’s supposedly an application that will figure out the absolute cheapest way to order the parts you need off of Brick link. You are probably familiar with Ebay so there isn’t much to say about it. You can look for pieces by bulk lots with color or you can look for individual parts by ID number. Pros: Pretty cheap prices. Great place to buy in bulk. Cons: Usually you can’t pick which pieces you get. Less variety of pieces. How to buy: Go to Ebay and either search for the ID number or find random bulk lots with the color you want and you may or may not get the pieces you want. 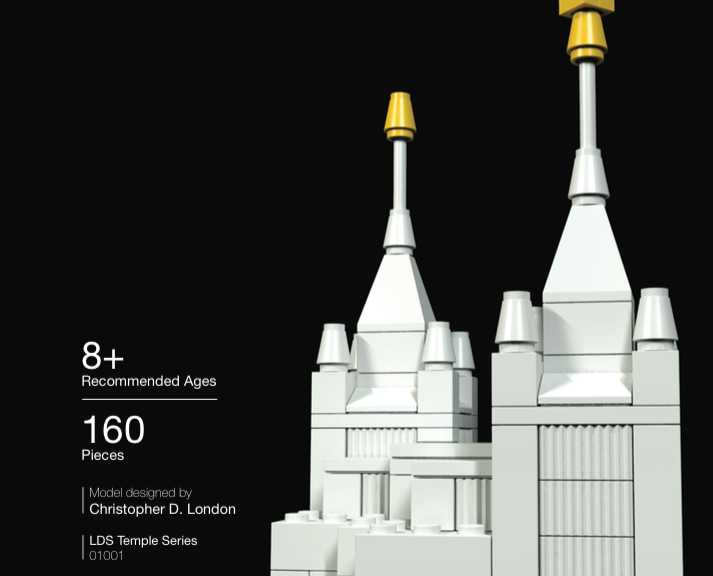 LEGO has an online shop where you can buy individual pieces. It’s more expensive than the first two options but you’ll get high quality brand new pieces. 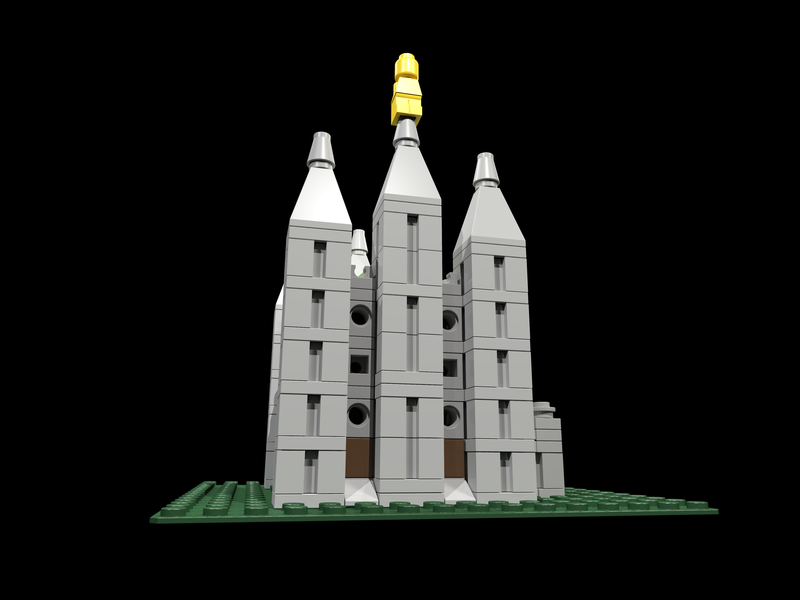 Note: Sometimes pieces get discontinued from LEGO and they may not have available all the pieces you need. Pros: All brand-new pieces. Good selection of pieces/colors. How to buy: Go to LEGO and enter the ID number into the “Design ID” search box toward the lower-left and it will bring up the pieces you need. Local LEGO stores and other toy/hobby stores may have a “Pick-a-brick” wall where you can buy individual pieces. You’ll have to do a web search to see if there are any near you. Pros: Buy pieces immediately. No shipping costs. You may notice our site design is still under development. Please bear with us as we finish our site! Check back frequently for updates on our designs. 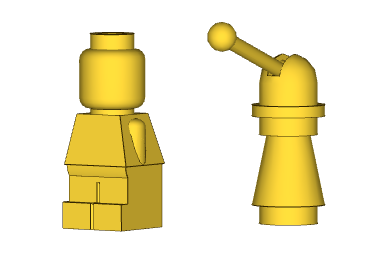 We are currently in talks with a manufacturer to have these sets built. Hopefully, you’re as excited as we are!